State and local vaccination requirements for daycare and school entry are important tools for maintaining high vaccination coverage rates, and in turn, lower rates of vaccine-preventable diseases (VPDs). State laws establish vaccination requirements for school children. These laws often apply not only to children attending public schools but also to those attending private schools and day care facilities. All states provide medical exemptions, and some state laws also offer exemptions for religious and/or philosophical reasons. State laws also establish mechanisms for enforcement of school vaccination requirements and exemptions. Who needs this vaccine? Find out here. CDC TV - Have You Heard? If traveling, please visit the CDC Travelers' Health site for the most updated travel information. 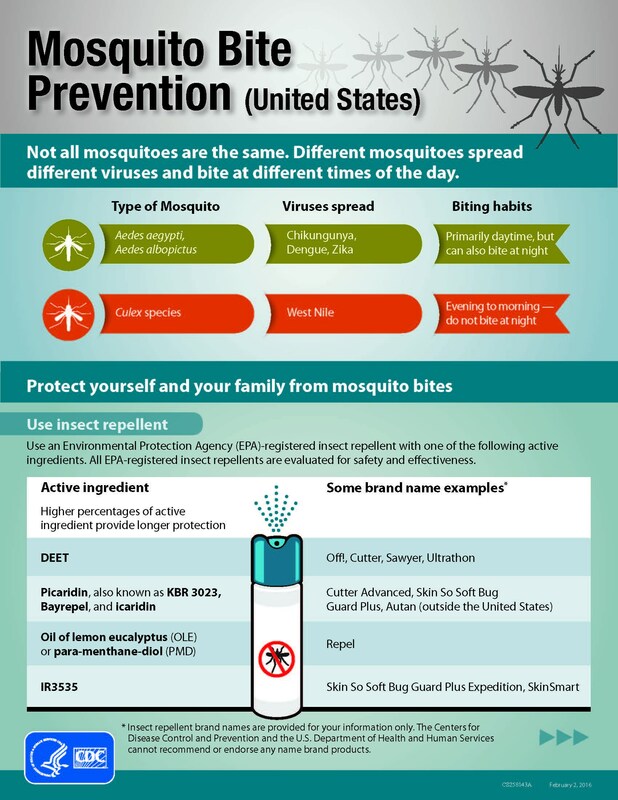 Click here for CDC Fast Facts and Posters. 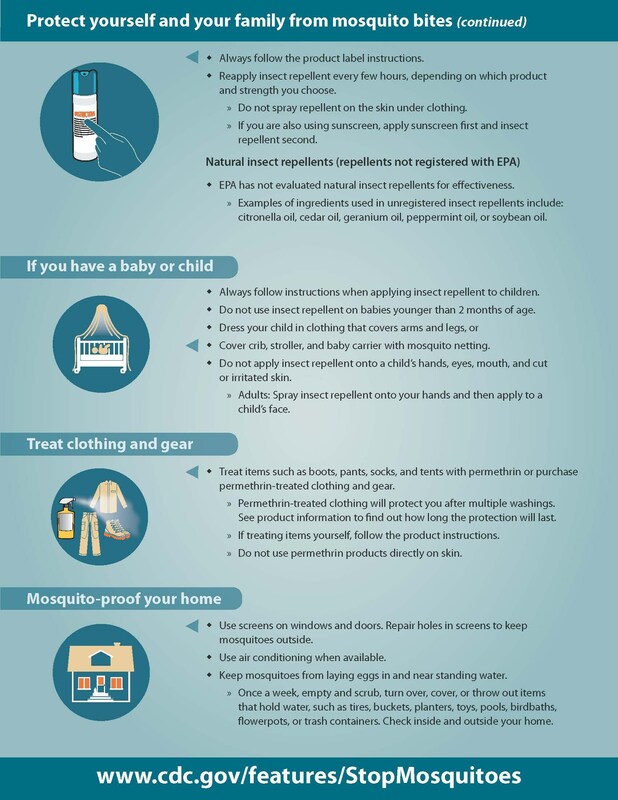 Click here for more information on the Zika Virus and pregnancy. Please get your children vaccinated against flu and influenza. Visit http://www.preventchildhoodinfluenza.org for more information. Remind your child to cover his/her nose and mouth when sneezing or coughing. Teach your child to wash his/her hands frequently with soap and water for at least twenty (20) seconds (about the same time that it takes to sing the “Happy Birthday” song twice). Ask your child not to share eating/drinking utensils. Teach your child to avoid touching his/her mouth, nose, and eyes. Teach your child not to share combs, brushes, hair bows, headbands, toothbrushes, hats, clothing, and other personal items with friends. Check your child’s head/hair at regular intervals throughout the entire school year for lice or nits, but especially if your child scratches his/her head frequently. Also, check your child’s head for a substance that appears to look like dandruff that is attached to the hair/scalp and is difficult to remove. If you need assistance, please contact the school nurse. Nits (eggs of the lice) are typically found around the ears and behind the nape of the head. They hatch within 7 days of being laid. New nits are typically those that are within 1/2 inch from the scalp. Nits are small and oval shaped with a pearly appearance. Lice is spread by head-to-head contact. Lice cannot live on smooth surfaces. If you have an active case of lice you must get rid of all the nits. All infected persons (household members and close contacts) and their bedmates should be treated at the same time. Over the counter preparations are available for treatment or you can contact your child’s health care provider.